The Pope of Rome hath erred. So, of course, hath the Pope of Alexandria, the Pope of the Coptic Orthodox Church, and we mustn’t forget the Pope of the Christian Palmarian Church of the Carmelites of the Holy Face. All of these popes err because their churches err, “not only in their living and manner of Ceremonies, but also in matters of Faith” (Art. XIX). It stands to reason that Anglicans might believe that these popes err, principally because their churches don’t believe or act as the Anglicans believe and act. But what happens when the Pope of Rome doesn’t believe or act as Roman Catholics believe he ought to believe and act? That’s simple: you issue a Filial Correction. That is, you get together with sundry dozens of others of fellow laity and presume to write to His Holiness on behalf of 1.2 billion of your co-religionists, politely telling the Supreme Pontiff that his teaching isn’t really so supreme after all, and that he is, in fact, teaching heresy. That doesn’t make him a heretic, of course. It is perfectly possible to propagate heresy and not be a heretic. This is a stasis of grace reserved for Roman Catholics: Anglicans and Protestants who preach heresy are, of course, full-blown heretics, totally beyond the pale, heading straight to Purgatory if not a worse place. But a pope who errs when he is not being infallible (when it would not, of course, be possible to err) is simply not being very diligent in guarding the Faith. Such carelessness demands a rebuke, and so 62 lay Roman Catholics have done what no bishops or cardinals have cared(/dared) to do (for that might move inexorably toward schism). It states that the pope (sic?) has, by his Apostolic Exhortation Amoris laetitia, and by other, related, words, deeds and omissions, effectively upheld 7 heretical positions about marriage, the moral life, and the reception of the sacraments, and has caused these heretical opinions to spread in the Catholic Church. Essentially, the Church of Rome never has erred and never can err, so when its Rector contradicts its dogmatic articles of faith, he must be in error. Pope Francis, the Rector of Rome, is of the view that the divorced and re-married (while the former spouse still lives) may participate fully in the Eucharist (ie consume the body and blood of Christ in a state of adultery). At least that’s what exhortation Amoris Laetitia appears to suggest (one says ‘appears’, for there are pending doubts or ‘dubia‘ still to be answered). This, of course, as we all know, is heresy. If it isn’t, then Sir Thomas More and Bishop John Fisher died in vain. Pope Francis didn’t decree Amoris Laetitia ex cathedra. He simply couldn’t, for to have done so would have made him a heretic, and thereby excommunicate. 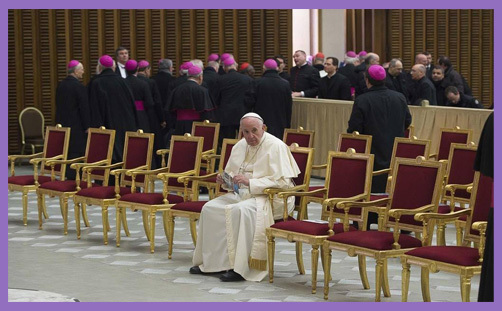 And you obviously can’t have a situation where the Pope isn’t in communion with his own church, can you? You can’t have a pope that errs to the point of being a heretic, for then he would cease to be pope. Except, of course, there have been popes in history who have excommunicated each other for their respective heresies, ergo popes may indeed err to the point of being heretics, or else they were falsely accused by popes who erred in the manner of their heresies without quite being heretics. …the signatories explain why, as believing and practising Catholics, they have the right and duty to issue such a correction to the supreme pontiff. Church law itself requires that competent persons not remain silent when the pastors of the Church are misleading the flock. …the pope (sic?) has directly or indirectly countenanced the beliefs that obedience to God’s Law can be impossible or undesirable, and that the Church should sometimes accept adultery as compatible with being a practising Catholic. So if the Pope can’t keep God’s Law, and no cardinals or bishops are prepared to tread the path taken by a certain monk on 31st October 1517, it is for the laity to correct and rebuke the Vicar of Christ. So when the sacred pastors aren’t so much representing Christ as propagating heresy, the Christian faithful are no longer bound to follow with Christian obedience. Essentially, the appeal of the 62 is to the higher interpretations, faithful traditions and immutable dogma of their denomination. This Filial Correction is both a rubuke to the lower-case pope (presumably the upper-case Pope resides in the convent of Mater Ecclesiae) and a warning to the faithful against popolatry: don’t idolise Francis, because he’s patently in error. “The 62 have consulted the teaching of the Catholic Faith over 2,000 years, expressed & upheld by popes, saints & countless faithful”, tweets Deacon Nick Donnelly, a signatory to the letter. Well, he’d naturally agree with the Church of England on this matter: to obey is better than sacrifice, but there is no limit to God’s mercy, compassion and forgiveness. Marriage is the natural foundation of the family, the basic unit of human social life; it is the form of grace that protects and controls the sexual instinct, one of the strongest human drives. Christian marriage is the gateway through which the grace of holy being made present in the sacraments can penetrate the wider world of human relations. But because they are natural, and because nature is fallen, marriages can fail because men and women are corrupted by sin and manifestly fail. And when they do fail, why should the fallen parties be forever cast from the table of the Lord’s Supper? It is not good for man to be alone: divorce and remarriage is not blasphemy against the Holy Spirit.